Lack of freshness in holiday email marketing is a dampener that makes it difficult for marketers to create innovative emails that drive higher conversions in the festive season. 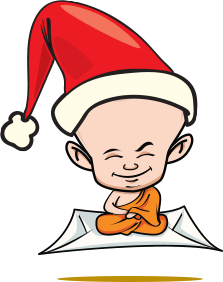 Monks bring to you an insightful holiday email marketing calendar with expert suggestions that would help you create a perfect holiday calendar and plan your campaigns well in advance. You will get distinct pro-tips that will help you draft an engaging email for every holiday. We also have 15 industry experts from notable Brands and Agencies like Shutterstock, Oracle, Convince and Convert, Trendline Interactive and MarketingSherpa to name a few - share uncommon Strategies to make your Holiday Email Marketing Campaign a success. Grab the subscriber’s attention with a smart and punny subject line. Instead of writing “Halloween Discount”, write something like “SPOOKDID SALE”. It would not only make the subscribers smile but also entice them to open the email. Add creative fonts in your email copy to stand out from the myriad of Halloween-themed emails in the subscriber’s inbox. Use an engaging and freaky tone to give the feel of the occasion. Include elements like the witch’s broomstick, ghosts, pumpkins, etc. that are unique to Halloween rather than using your routine branding colors. You can also have interactive elements that create a festive spirit, thereby driving more conversions. Plan it at least 1 month in advance so that you can get enough time to spookify your subscribers. According to National Retail Federation, more than 174 million Americans shopped in stores and online during the 2017 Thanksgiving holiday weekend. Thanksgiving Day is no longer the traditional day of just expressing gratitude to your loved ones. Generous online spending has made it an important buying day of the holiday season as well. This makes it important for marketers should leverage email marketing to make the most of this shopping extravaganza and show appreciation for their subscribers and customers. Let your subject lines reverberate the vibes of gratitude but try to stand out from the plethora of thanksgiving email subject lines sent during those days. Your email copy should reflect the essence of Thanksgiving by saying “THANK YOU” to the subscriber. You can even promote discount offers and giveaways that match the mood of the Holiday. Thanksgiving is all about drooling on the large and deliciously roasted turkey, celebrating the festivities and enjoying football. Let the interactive elements like GIFs and CSS animations in your email do the talking. Create urgency through limited time offers displayed with the help of a countdown timer and tap on the ‘Fear of Missing Out’ instinct of your subscribers. In 2017, Black Friday spending reached $1M per minute and it became an online sales record. Cyber Monday was the biggest online Email marketing if done right can help you reach maximum number of subscribers and achieve outstanding results. Here are tips that can help you with your conversion goals. Write thoughtful subject lines that promote the Black Friday and Cyber Monday sale. Subscribers are more likely to open such emails that provide them with an opportunity to shop at discounted rates. Your subscriber is likely to receive a plethora of emails promoting ‘holiday sales’. Make sure that your recipients get an attractive offer that they are sure to avail, thus helping you generate conversions. Keep it short and sweet. Discounts are everywhere in holiday emails. So, it is the email design that would help you stand out. Try gamification, keyframe animations, and kinetic designs to make your emails visually impressive in the teeming inboxes. Pro Tip: Write a creative CTA other than “Shop Now” or “Buy Now” to grab the subscriber’s attention & encourage them to purchase from you. Bless your subscribers with uniquely cheerful subject lines that would stand out and entice your subscribers to open the email. Wish your subscribers and customers with an interesting Christmas greeting that would enhance their high spirits. In addition, promote your exclusive discounts and share some extraordinary gift ideas to lure more customers. Your email design is not complete without pretty Christmas trees, little snowflakes, cute snowman, glittering fairy lights, adorable reindeer, and of course an endearing Santa Claus. Create an innovative rich media email with the help of all these Christmas props and your email is all set to bring unmatched results. Gift guides go a long way in garnering conversions for your business. So, go ahead and give it a try. Pique the subscriber’s interest by using a dash of suspense in the subject line that conveys something awesome lies in store for the New Year. Greet your subscriber with a New Year wish and go on to unveil what’s new in store for the subscriber in the coming year. Make your copy interesting enough so that it gets the desired click-through rates. Build a creative email design that aligns with the exuberance of the New Year. Rather than using the same ol’ modular and reusable templates, try out custom templates that would knock out the monotony of your previous year emails. That would be the perfect New Year gift to your subscribers as well as your marketing strategy. A win-win situation for both, eh? UNIQUENESS is the key as your subscribers are all set to make a new start in the year to come. Provide value to the recipient by combining beautiful design and data. It’s an opportunity for a surprise and delight moment. Show them some data around how they have been interacting or purchasing from your brand and thank them for doing so. This up-levels email personalization and makes a one to many email feel more like a one-to-one experience. Finally, give them a holiday offer of value. This can be a coupon, a free-trial, an ebook with information or anything that is unique to your audience. Holidays is an opportunity for a surprise and delight moment for your subscriber, so provide them value. Keep a close eye on your by-domain reporting to catch issues with inbox placement as soon as Holidays start. Understand how your primary lists break down in terms of domain share and monitor open rates by domain with each send. If you see Gmail, for example, go from 23% to 14% in a single send, it's time to triage. Some tactics I use include limiting the affected audience to a tighter activity window, running a segment through an email validation tool to identify potential bad actors, or running a seed list test through a third-party tool to better understand deliverability activity on the IP addresses and sending domains. Keep a close eye on your by-domain reporting as Holidays start. Understand how your primary lists break down in terms of domain share and monitor open rates by domain with each send. The Holiday season can be one of the most stressful times of the email calendar year. Things change in an instant and it seems there is always a push to do more each and every year. 1. Site Interruption/Down capture & email: Sites go down. Have a contingency landing page to capture an email address with a notification to the subscriber base once things return to normal. We recommend that you test offer vs. no offer in that follow-up email. 2. Volume increase email: As you dial up the frequency during this time period, an email to high value customers explaining the frequency and timing around them will be a breath of fresh air. You might even stave off unsubscribes from your best people. 3. Get ahead: Send an email in advance to purchasers from last year to give greater incentive to come back and buy again. The Holiday season can be one of the most stressful times of the email calendar year. Gear up with a contingency landing page, in case your website services are interrupted. Create a short list of bloggers who wrote gift idea roundups, especially those who wrote roundups that got shared a lot. Now the magic happens ...or it doesn't. Did they mention you in a roundup of gifts for this year? It's about networking, influencer marketing with a healthy dash of email." Use these two lists to inform your overall strategy. Very few companies start holiday campaigns by putting the needs and desires of your subscribers at the forefront of their strategy. This is how you stand out and truly win at email marketing in the holiday season. Do not, under any circumstances, do a 12 Days of Christmas countdown consisting of 12 daily emails. Please. Do not, under any circumstances, let your sales goals or your year-end bonus drive your frequency of emails sent. Please. Do not sell. Let me repeat that: Do NOT sell. The holiday season is about reflection and giving and your efforts to sell more in an already saturated purchasing season is not helpful. If you typically sell smoke detectors, send sincere reminders (on brand) to change out the smoke alarm batteries by the end of the year. If you sell ties, send images of the best ways to tie the most popular trending ties, with links to narrated how-to videos. Make two versions for each – one as a person ties the tie themselves, and a second showing someone else (spouse) tying the tie on someone. If you sell auto insurance, offer a no cost, no obligation annual insurance review with the intent of saving each recipient 10% on next year’s premiums, by being helpful, efficient, and looking for ways to provide cost savings to the recipient. Regardless of what your business is, focus on being of service and providing helpful, relevant assistance that is so valuable, the recipient will appreciate it. If you build your brand’s rapport – and the sender’s rapport, the revenue and referrals will follow. Do NOT focus on SELLING the product, focus on being so helpful – your recipients will appreciate. If you’re trying to hit holiday sales goals, your gut reaction may be to just send endless sales and promo emails. But think bigger. Your email program should be communication that helps the customer and that the customer enjoys. Besides, their inbox will be bombarded with sales emails already, and your brand needs to stick out. For example, MVMT Watches increased holiday revenue 262% by sending emails that also included appealing content. “We use blog content in our emails, and we've done some really cool videos … high production videos that we're traveling the world,” Jake Kassan, CEO, MVMT Watches said in his MarketingSherpa case study. Promo emails optimized for conversion play an important role in a holiday email marketing campaign. So you need that as well. Just don’t make every facet of every email you send an ask. You have to give to your email subscribers as well, or they won’t stay subscribers for long. After all, ‘tis the season to be giving. Your email program should be communication that helps the customer and that the customer enjoys. Get your email house in order early this year. Don’t wait until the holiday season is underway to re-activate lapsed subscribers. If you’ve ever used Black Friday to try to re-engage inactive subscribers, you know how risky this approach can be. You’re taking a big gamble that your entire program could get blocked at the most important time. With careful planning, run your re-engagement and winback programs several weeks before the holiday season begins (it’s never too early). Use careful audience segmentation, including recency of opens and clicks, and selectively expand your audience for targeted, relevant campaigns. Don’t go overboard. Get greedy and you risk causing blocking and filtering on your email programs when it’s going to hurt the most. Start early, spread these efforts out over time to minimize negative impact, and allow your sender reputation to rebound before your holiday promotions switch into high gear. You’ll have a refreshed subscriber list, and a strong reputation heading into holiday. Then you can confidently schedule your best holiday email marketing calendar with fewer deliverability limitations. Senders investing in good deliverability practices and following these steps have seen increases in email opens during peak season up to 30%. If you plan to ramp up the number of emails you send to your customer, let them know ahead of time that they will see more great emails from you. Treat it as a fun way to let your customer know they’ll see more emails from you in the coming months. Make sure you have a good approval (and backup approval) process because people go on vacations, get sick, etc. and when you're running hot - with lots of campaigns - that's no time to work on process changes. Plan for mistakes to happen. Again, when things are going fast, you don't have time to stop and think about what to do, so we recommend having an established error management process. Determine if you even want to acknowledge mistakes - maybe your organization doesn't want to send "oops" emails. If you do, then have a simple template (creative) ready to go that aligns with your brand voice (i.e. don't try to be kitschy if that's not your brand) and you can hopefully modify it quickly. Segment your best customers by overall annual spend and hold “super-secret” exclusive advance holiday sales for them, with specific date deadlines. For example, you might pick a single week in September - far in advance of the typical holiday promotional period – to surprise and delight these customers with unexpected deep discounts or advance previews of holiday deals and merchandise. Use time and/or inventory countdown timers in your email creative, especially since many holiday offers have strict offer and/or shipping expiration dates. These create a “can’t-miss” visual that heightens urgency to “buy now” before time or quantities runs out. Use time and/or inventory countdown timers with a “can’t-miss” visual that heightens urgency to “buy now” before time and Offer runs out. One way you can win your customers this Holiday Email Marketing season is through solving their biggest pain point – finding the right gifts. Even on Christmas Day, hundreds of thousands of people frantically run around the stores in search of the perfect present instead of spending that time with their families and friends. But simple product recommendation emails won't cut it. They only take into consideration your – and other similar users’ – previous purchase behavior or search history. And that's often not enough to form good recommendations, especially if you’re buying for someone else this time. This time try taking a different approach. Take the guesswork out of the equation. Build an interactive quiz or a survey and send it to your customers. Ask them about the person they want to buy the gift for - What are they like? What are their hobbies? How would they rather spend their free time? Use their answers to form personalized recommendations and deliver them over a more extended period of time. This way you'll give them time to make up their minds. Make sure you don't start this campaign too late. You want to take away the stress from your customers, not intensify it. So, be helpful, and you’ll see the results soon. Create innovative Holiday email campaigns to help your customers solve their biggest pain point – finding the right gifts. Everything is about planning and following through with your plans. Being successful with your Holiday Email Marketing means thinking well in advance. Not weeks, but months! Start with an overarching strategy including your targets, your messaging, your promos and discounts. Work all the way down to the details: who does what and when. Set up realistic deadlines about the content to include, the deployment dates, the designs. Planning is really key! Start with an overarching strategy including your targets, your messaging, your promos and discounts. List one – what do my subscribers need from me at this time of year. What’s critically important. This will be different for each segment and down to each individual but creating a picture of what subscribers really need from you, stops you from falling into the trap of only sending what you want to send. This list is step one in subscriber-centricity. List two – what do my subscribers desire from me at this time of year. This is everything that they feel they would like, but they are not critical needs. Thinking about this list carefully after you’ve created your list of needs, is how you get really close to subscribers. Start your holiday campaigns by first making 2 lists that meets and exceeds the needs of your subscribers. Retailers who already have conducted basket analyses to predict gift buying patterns outside the world of email should take the time to connect these models to email campaign strategy. This often involves combining purchase data with behavioral data (web behavior and specific email content or product clicks). Simply displaying products based on previous web page visits may not be enough to generate hyper-relevant gift suggestions in email. However, combining this information with segment-specific buying patterns at an individual level can yield more relevant offers and higher engagement. Pair this with a modular, dynamic email template that can easily and automatically tailor content at an individual level and you have a message delivery system that takes full advantage of previously disconnected insights. Finally, reduce friction to purchase inside the inbox. New end-to-end checkout functionality can now be implemented inside the email itself – albeit in a limited fashion. Long story short, use the data you have in order to provide a more compelling offer – and use new technologies to reduce the steps required to make a purchase. It’s important to realize customers increasingly expect personalization of messages based on previous behavior and past purchase history. One of the biggest missed opportunities I see with marketers—especially with holiday marketing campaigns—is that they treat their email strategy as just that: an email strategy. If you’re selling online, you need to view your email strategy as a part of larger strategy, a strategy that’s heavily weighted towards web. Even just implementing web triggers into your email journeys is going to massively improve campaign results. Most retailers are already doing that with abandoned cart triggers—which are important, of course—but that’s only one aspect of a winning holiday email marketing strategy. You need to really understand how your customers are planning for the holidays, based on how they’re interacting with your online store—web tracking is critical there—and have emails ready to respond to key actions leading up to and after purchase. Sending out product recommendations after an initial purchase, offering discount codes after a period of inactivity, and even putting together personalized wish lists based on behavior and demographics—these combined web and email efforts are going to put your company way ahead by year end. Implementing web triggers into your email journeys can help massively improve campaign results. JC Penny, Sportsman's Guide & Travelocity.